One - 2 dram* (1/4oz) amber glass dropper bottle of Syn-TC. *You may choose a larger size. Skin smoothing products, High performing facial, Anti-ageing formulas, Anti-wrinkle and anti-photoaging solutions, Plumping beauty products. You have the option to apply your actives directly into any product that you currently have. *Dare we suggest adding these actives into our Derma Snap 8LM or GABA creams - which are both already teaming with penetration enhancers and other proven actives???? Looking young and beautiful is widely accepted to be a source of professional success and personal happiness. 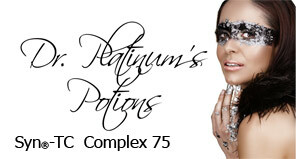 Collagens play a major role in the skin, ensuring proper functionality and thus perfectly smooth, young-looking skin. During the process of ageing our body's natural production of collagen in the skin decreases, and as its functionality is reduced, typical signs of ageing become visible. 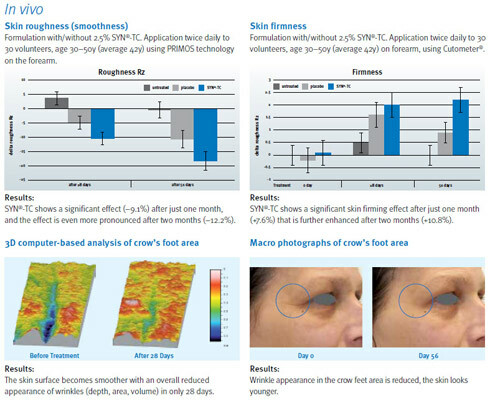 Whilst traditional anti-ageing approaches mostly focus on dermal collagen type I, SYNR-TC follows a more holistic approach that focuses on total collagen care. A particular focus is set on collagen type III - the so-called youth collagen - that is known for its skin smoothing properties, especially in young skin. Additional focus is set on the collagens of the dermal-epidermal junction (DEJ), especially on collagen IV, VII and XVI, the so-called anchoring collagens that are essential for skin functionality and support skin firmness. Glycerin, Aqua, Tetradecyl aminobutyroylvalylaminobutyric Urea Trifluoroacetate, Palmitoyl Tripeptide-5, Palmitoyl Dipeptide-5 Diaminobutyroyl Hydroxythreonine. 2.5% SYN(R)-TC *Ours is a 75% Solution (7% at 3 drops). Collagens are the most abundant proteins in the skin, making up 75 percent of the skin proteins. Collagens are mainly responsible for the skin's strength and smoothness as they provide structure and firmness. However, over time collagen levels decrease and their proper function is reduced. SYNR-TC is a synthetic peptide-based complex tailor-made for optimal activity. In vitro, SYNR-TC peptides increase the formation of undamaged, stable and homogeneous collagens to facilitate their unique contribution to beautiful smooth skin. 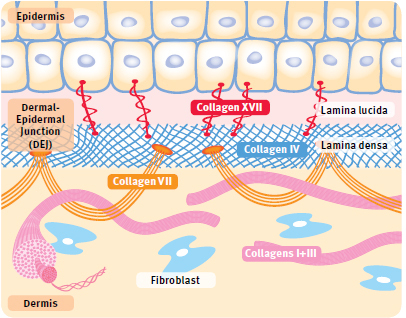 The picture (above) shows the tight interaction between the dermal collagens I and III and the DEJ collagens IV, VII, and XVII. Each of these collagens varies in structure and functionality. DSM's key finding was that in order to ensure highest collagen level and functionality in vitro different tailor-made peptide sequences have to be combined. SYN(R)-TC is a combination of those peptide sequences that work in vitroon dermal collagens I and III as well as on the DEJ collagens IV, VII, and XVII - all in one product. SYN(R)-TC is a registered trademark of Pentapharm. Purified Water, Glycerin, Ethoxydiglycol, Palmitoyl Tripeptide 5, Tetradecyl Aminobutyroylvalylaminobutyric Urea Trifluoroacetate, Palmitoyl Dipeptide-5 Diaminobutyroyl Hydroxythreonine, Palmitoyl Dipeptide-5 Diaminohydroxybutyrate, Magesium Chloride, Polysorbate 20, Benzyl Alcohol, Methylisothiazolinone.